Technology has truly advanced. 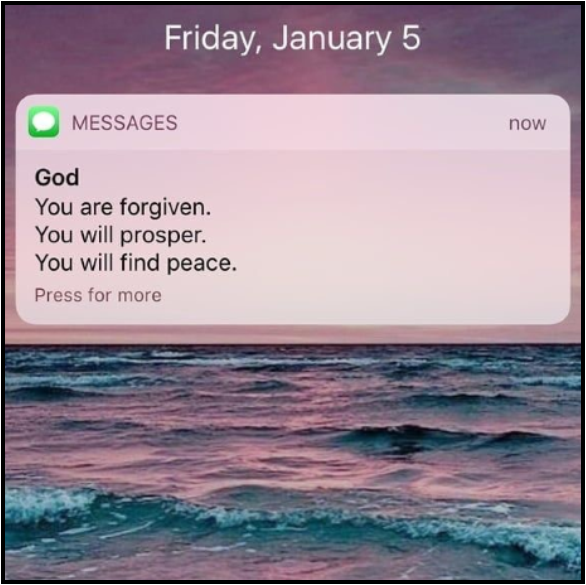 We can now receive text messages from God. It’s true: just pick up your phone and look at all those verses! Get a little Pinterest pick-me-up from the Almighty. No time for Bible study? Click a little Sprinkle of Jesus with your coffee, and you can tackle the day. But taking a moment to view the framed scripture on a backdrop of lilies that says we can do all things through Christ doesn’t mean that we have spent time in God’s Word. What’s worse is when Scripture takes second place to a never-ending string of cheap inspirational quotes: Readjust your crown – you’re a child of the king! The devil wants to steal your happiness – stay positive! Our culture has turned servanthood to Christ on its head to the point where He’s just another convenience for our lives, complete with catchy jingles: Your best life now! Life’s a gift: enjoy it! God is setting things up to come together just for you! But, wait! Doesn’t God want to bless and prosper me? Absolutely. Life is a gift and God wants you to enjoy it because He loves you. He doesn’t want you to live at the whim of other’s opinions. He is working all things together for the good of those who love Him. God is ever gracious: He protects us, keeps us, forgives us, and brings us peace. And He’s most definitely bigger than all our problems! Well, then, what’s the big deal? What’s so wrong with encouraging or motivating people with Scripture, or even with positive clichés? If cute quotes are enough for us – if they keep us from exploring the fullness of God, diminishing His majesty and replacing His Word – then it is very wrong, especially coming from believers in Christ! Doubt – Wait! Life isn’t perfect, and God hasn’t texted me to assure me that everything will be okay! I’m stressing out! Why doesn’t He prosper me and bring it all together the way I think it should be? Anger – God, where are you when I need you? This is all Your fault. You’re supposed to make my life perfect! How could You let me down?! How could You do this to me? 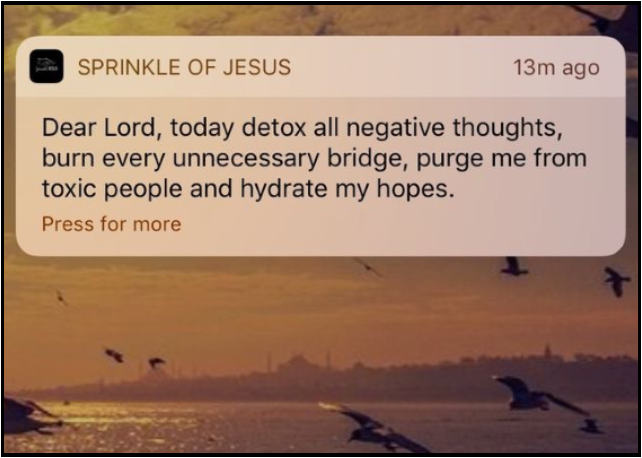 Ingratitude – God, You said You’d help me fight my battles, but I didn’t even get to Starbucks today, people treated me rudely, and I’ll never be popular. Don’t You know what’s important? Snobbery/Apathy toward Souls – Lord, I really need You to keep all those toxic people away from me. All I want is for You to bless me and my family and help us to be happy and peaceful and comfortable. Oblivion – Regardless of whether or not you are caught in the trap of feel-goodness, beware that those beautiful Scripture cards and artsy Bible accessories have not dulled you to this truth: We are at war! In this amazingly blessed country of comparatively small struggles, where conflicts are resolved in a 30-minute sitcom (or at most, a two-hour movie) we have become insulated against the harsh realities of war. In any war, propaganda is a successful strategy, and the devil is the father of lies and propaganda. He can make himself out to be so overwhelming that we cower motionless before him. But his favorite trick is to convince us that he is no big deal, so that we run to and fro, so consumed with our lives that we see no threat at all. Remember, the devil knows the Bible. He even quoted Scripture to Jesus, picking verses out of context to try to make Him disobey God’s will and purpose, and he has no qualms about twisting and distorting the most amazing, glorious promises of God in order to draw you away from your purpose in Him. Scripture reveals the devil as he is: not an annoying little pest who just wants you to worry so you can't enjoy life, but a gruesome, hate-filled monster who prowls about like a roaring lion seeking whom he may devour (1 Peter 5:8-9). Jesus said Satan is the thief who comes to steal, kill, and destroy (John 10:10). He wants to steal from you the core of who you were created to be and the mind that God created for you to think on Him and discover Christ for yourself. He wants to kill you – physically? Perhaps. Spiritually, far better for him – dulling the blade, making you ineffective so you go on living without being truly alive. He wants to destroy you, i.e. (per Webster): put an end to your existence; ruin you emotionally or spiritually; defeat you utterly. (Synonyms: demolish, knock down, annihilate, wipe out, obliterate, wipe off the face of the earth, eliminate, eradicate, liquidate, erase, slaughter, terminate, exterminate, euthanize… you get the idea. A bit more than causing you to miss your morning latte). God’s Word paints many beautiful images, but as I read through, I also see how God describes Himself: as a Fortress and Strong Tower; a God of Strength who fights for us and provides refuge in time of war. He calls us to fight for the souls of men, not to be distracted into a life of self-serving comfort. Leonard Ravenhill said, “The early church was married to poverty, prisons and persecutions. So, how do we readjust this mindset to combat the complacency of Pinterest Christianity? 1. Know Your God. The more you truly know someone, the harder it is to believe a lie about them. If you’ve spent solid time with your best friend, you’ve learned how they think and act, and can immediately recognize misrepresentations of their character. We learn to know Christ through His Word. Soaking in it, marinating in it… not just dipping our toes into an isolated verse on Pinterest. Digging, mining, pondering, we make it part of us. We learn what is out of character for Him, and can guard ourselves against lies that the enemy tries to feed to us on every front. 2. Know Your Enemy. In God’s Word he also gives us a clear picture of our adversary. Take time to really understand. Learn to hate him. Yes, I said hate! Recently, as he tried to do away with me physically, I’ve truly come to understand why hating the great deceiver is important. In the midst of that trial a good friend got in my face and said, “Look, he’s killing you, and trying to tear your family apart. And all you’re doing is feeling sad about it. 3. Know Your Weaknesses. Hey, we’re all human. We all fall short, this isn’t permission to condemn yourself for all your faults. Only your enemy does that, not your Savior. But understanding your weak points helps instruct you as to where the enemy will most likely strike on the daily. The pitfalls we so easily get tripped up on may be where he seeks to drive a wedge in the door. Our God is a good God! Not only does He give us His own armor, He tells us how to put it on! Don’t leave for battle without it! The basics are the same, but we each fight differently. Your personal fight may be about battling particular assaults and situations that hang you up. Ask God to reveal it to you. I encourage you, brothers and sisters, to combat false gospels wherever you find them – and however innocent they may appear. Don’t allow them to take you out of the fight. Don’t let them offer you a false sense of immunity. As free as we are now, persecution will come (2 Timothy 3:12). Salvation and relationship with Christ is the ultimate blessing. That a perfect God would love us enough to die for sinful men defies comprehension. He invites us to join the battle with Him for the souls of men, constantly arming us with His Word and His blessings. Let us stand together to reach a world lost in sin, to reach Christians lost in half-truths (lies), and to become a renewed force to be reckoned with against the onslaught of the enemy’s schemes. As in any war, bad days will come, along with hardships, trials, and pain. Setbacks will come: some as small grievances and others as true tragedies. But victory will also come. Christ Himself said, “In the world you will have tribulation. But take heart; I have overcome the world.” (John 16:33). Older PostFamily: Let it shine!